Canara Bank, which has long been reeling under piling non-performing assets or bad loans, on Wednesday appointed cricketer Shikhar Dhawan as its brand ambassador. The state-run lender named the young cricketer as its brand ambassador as it is gearing up for the next phase of banking with a special focus on the country's youth. RK Dubey, Chairman & Managing Director of Canara Bank said that the bank and Dhawan had a lot in common. Bangalore, Nov 12 : State-run Canara Bank posted Rs. 626-crore for the second quarter (July-Sep) for this fiscal (2013-14), a decline of 5.3 percent year-on-year (YoY) from Rs. 661 crore in the same period year ago due to higher provisioning against bad loans. "Total income, however, increased 13 percent YoY to Rs. 10,428 crore during the quarter under review (Q2), from Rs. 9,204 crore in like period a year ago," the bank said in a statement here. Similarly, operating profit rose 11 percent to Rs. 1,425 crore from Rs. 1,282 crore a year ago. India's public sector bank, Canara Bank has said that its net profit has risen by 6.80 per cent to Rs 7.75 billion during the first quarter of the financial year compared to Rs 7.25 billion recorded in the same quarter of the previous year. The total income of the company increased 18.91 per cent to Rs 91.65 billion for the quarter till June 30, 2012 compared to Rs 77.07 billion in the same quarter of financial year 2011-12. Interest earned increased 18.39 per cent during the quarter was at Rs 84.72 billion as against Rs 71.56 billion. Indian private sector bank, Canara Bank has reported a fall of 26 per cent in its net profit at Rs. 876 crore during the third quarter of the financial year till December 2011. The total income of the bank rose from Rs. 6,444.55 crore in the same quarter of 2010 to the level of Rs. 8,591.15 crore in the quarter till December 2011. The deposits in the bank rose 19.7 per cent while advances increased by 15.5 per cent during the quarter. Canara Bank is reported to have experienced a major fall in its first quarter FY12 net profit, though at that period, the net profit of the bank dropped to Rs 726 crore from Rs 1,013.4 crore, a year ago. Also, the net interest income surged almost by 4% to Rs 1,793 crore from Rs 1,728 crore yearly, as the gross non-performing asset of the bank increased to 1.67% in the April to June quarter over 1.46% in the corresponding quarter last fiscal year. 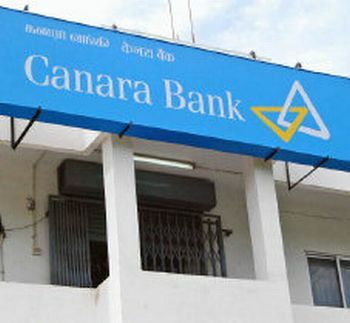 Bangalore, May 5 : Leading state-run Canara Bank posted net profit of Rs. 899 crore for the fourth quarter (January-March) of fiscal 2010-11, registering a whopping 79 percent year-on-year (YoY) growth. For fiscal 2011, however, net profit increased 33 percent (YoY) to Rs. 4,026 crore from Rs. 3,021 crore a year ago. "Record cash recovery (Rs. 2,032 crore), lower provisioning (Rs. 181 crore) and higher income from core banking business have shot up net profit to 79 percent YoY in the fourth quarter," Canara Bank chairman and managing director S. Raman told reporters here. Technical analyst Hitendra Vasudeo has maintained 'buy' rating on Canara Bank stock with targets of Rs 646 and 661. According to analyst, the investors can buy the stock with a stop loss of Rs 630. The stock of the company, on April 04, closed at Rs 641 on the Bombay Stock Exchange (BSE). Current EPS & P/E ratio stood at 88.54 and 7.23 respectively. The share price has seen a 52-week high of Rs 844 and a low of Rs 345 on BSE. Archana Bhargava took the charge of Executive Director of nationalized Canara Bank. Technical Analyst Dhaval P Vyas has maintained 'buy' rating on Canara Bank stock with a target of Rs 619. Mr. Vyas said that the stock can be purchased with a stop loss of Rs 603. The stock of the bank, on March 21, closed at Rs 606.40 on the Bombay Stock Exchange (BSE). Current EPS & P/E ratio stood at 88.54 and 6.83 respectively. The bank has lifted up Rs 1993.20 crore via QIP by issuing 33 million equity shares at the rate of Rs 604 per piece. Technical analyst Simi Bhaumik is bullish on Canara Bank and has maintained 'buy' rating on the stock to attain a target of Rs 670 in the shot run. According to the analyst, the investors can buy the stock with a stop loss of Rs 610. The stock of the bank, on March 16, closed at Rs 634.45 on the Bombay Stock Exchange (BSE). Current EPS & P/E ratio stood at 88.54 and 7.10 respectively. Technical analyst Ashish Chaturmotha maintained 'buy' rating on Canara Bank Limited stock with a target of Rs 640. According to analyst, the investors can buy the stock with a stop loss of Rs 580. The stock of the company, on Feb 21, closed at Rs 599 on the Bombay Stock Exchange (BSE). Current EPS & P/E ratio stood at 88.54 and 6.55 respectively. Technical analyst Mitesh Thacker has maintained 'sell' rating on Canara Bank stock with targets of Rs 635 and 620. According to analyst, the investors can sell the stock with a stop loss above Rs 725. Mr. Thacker said that the investors can sell the stock as there are full chances of decline in the coming days. Today, the stock of the company opened at Rs 690.15 on the Bombay Stock Exchange (BSE). Technical analyst Anil Singhvi has maintained 'buy' rating on Canara Bank Ltd stock with an intra-day target of Rs 760. According to analyst, the investors can hold the stock with a stop loss of Rs 693. The stock of the company, on November 29, closed at Rs 709.30 on the Bombay Stock Exchange (BSE). Current EPS & P/E ratio stood at 87.44 and 8.42 respectively. For the Q2 which ended on 30 Sept, 2010, State-owned Canara bank posted 10 percent growth in net profits. Today, at Bombay Stock Exchange the bank touched it's all time high, of Rs. 693.30 while surging 5 percent from yesterday. On Wednesday, for second quarter which ended on 30 September, 2010, the bank reported Rs 1,007.8 crore net profits compared to the profit of Rs. 910.5 crore, in the same period of the last fiscal year. 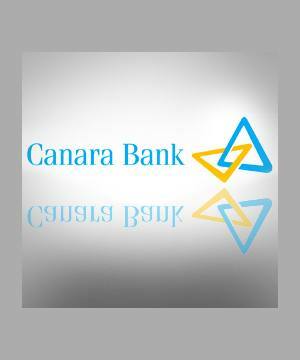 Stock market analyst Rahul Mohinder has maintained 'buy' rating on Canara Bank Ltd stock with targets of Rs 527 and 538. According to analyst, the stock has support at Rs 500. The stock of the company, on August 31, closed at Rs 514 on the Bombay Stock Exchange (BSE). The share price has seen a 52-week high of Rs 539.80 and a low of Rs 262.10 on BSE. Current EPS & P/E ratio stood at 84.87 and 6.11 respectively. During the last month, Canara Bank has raised its benchmark prime lending rate (BPLR) by 50 basis points w. e. f. August 12. State-owned Canara Bank has announced its Q1 financial results for the fiscal year 2010. The Bank has managed to post a net profit of Rs 1,013.37 crore for the quarter that ended in 30th June, 2010. This net profit figure has grown up by 82% in this quarter as compared to the same quarter in the last fiscal. The net profit for the same quarter last year was Rs 555.33 crore for the bank. This has been informed by Canara Bank in a filing at the Bombay Stock Exchange. The total income of the bank has also increased in this period of time. State-run Canara Bank has registered an increase of 83% in its net profit, which stood at Rs 1,013 crore during the first quarter (April-June) as compared to Rs 555 crore during the same period of last year (2009-10). Mr. A. C. Mahajan, Canara Bank chairman and managing director said, "We have posted a record net profit in the first quarter owing to nine-fold jump in income from treasury operations and net interest income (NII) growing by 34 percent YoY to Rs. 1,728 crore from Rs. 1,291 crore year ago." A top official in the State-run Canara Bank is expecting the net profit for the bank to raise 20-25 per cent from a year ago. The treasure income registered was 4.33 billion rupees in September quarter, but it will be lesser in the December quarter, leading to a flat net profit growth, A.C. Mahajan, chairman and managing director, said on the sidelines of a conference organized by Indian Banks' Association and State Bank of India. The bank has already recovered 9 billion rupees of bad assets since April and speculates to make an 11-12 billion rupees recovery in 2009/10. 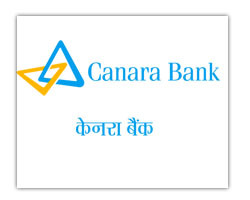 Stock market analysts have maintained 'buy' rating on Canara Bank Ltd with an intraday target of Rs 420. According to them, interested traders can purchase the stock around Rs 408 with a strict stop loss of Rs 402. If the bourses remain on the positive track, then the stock price will hit a target above Rs 422. Shares of the company, on Friday (Dec 04), closed at Rs 408.15 on the Bombay Stock Exchange (BSE). The share price has seen a 52-week high of Rs 437.45 and a low of Rs 144.25 on BSE.